Editor's note: We're launching our first Android for Work Live online event to share how Android is transforming the workplace, expanding the business role of mobile devices and helping companies like Guardian Life Insurance Company achieve more with mobility. The event will take place on Wednesday, Nov 4th at 11 am PDT. Register today. Mobile devices are essential for navigating our personal lives, from buying movie tickets and guiding us to weekend get togethers to helping us take out a home loan. For consumers, it seems that almost anything can be done now using smartphones and tablets. But in business, these devices have only just begun to change the way we work. When we launched Android for Work earlier this year, we set out to close this gap, by helping companies use Android’s flexibility and choice to make the most of business mobility. Why? Because we see a world where mobility means so much more than mail, calendar and contacts. This year, more than 10,000 companies are testing or deploying Android for Work, and Frost & Sullivan recently awarded us the 2015 North America Visionary Innovation Award for Mobile Enterprise Productivity. With Android Marshmallow, we’re taking another step in that journey by building out support for deploying Android devices in a host of scenarios – from dedicated employee use to installing customer-facing hardware that makes interactions more dynamic and responsive. Hear from Andrew Toy, product management director for Android for Work, who’ll discuss the broad vision of Android in the workplace and how businesses can mobilize every worker and workflow. Learn how Android’s vast selection of devices – from affordable phones to locked-down hardware and customized devices – creates choice and agility for BYOD, corporate deployments and single-purpose scenarios. Get an in-depth look at how companies can rely on Android’s built-in multi-layered protections to keep business data secure and managed across all devices in an overview from Adrian Ludwig, technical lead for Android security. Hear insights from Android customers, including Guardian Life Insurance Company. 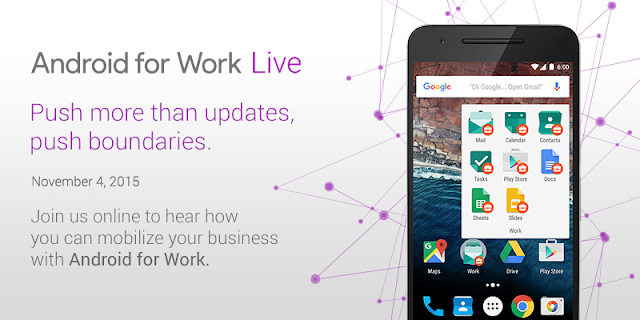 Register for Android for Work Live today and join the conversation on social media using #AndroidforWorkLive15.